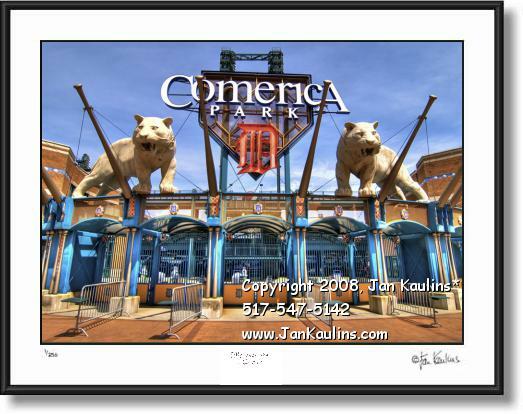 COMERICA PARK Detroit Tigers photo picture print photography poster art for sale. This DETROIT COMERICA PARK Detroit Tigers photo picture print for sale was taken of the Southwest entrance to Detroit's COMERICA PARK baseball Stadium in downtown Detroit. It is artistically an excellent image of the entrance to this magnificent structure with two huge Tigers looming overhead. The vibrant colors and artistic appearance of this image are a result of nationally known photographer and artist Jan Kaulins having taken nine separate bracketed digital photographic exposures and blended them artistically to creat this unique photo.